I'll Bite: Cookbook Giveaway: Ready to take 'Potluck'? I love potlucks, but I dread the pressure: How to pick a recipe that will please the most number of people, transport well -- and won't be too hard to make? 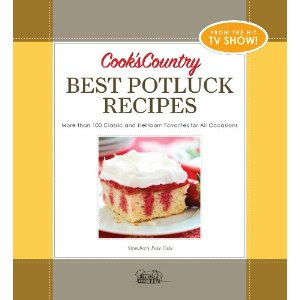 "Cook's Country Best Potluck Recipes" is a new collection from the editors of Cook's Country magazine. The recipes focus on classic and heirloom dishes that have stood the test of potluck time. It's got a durable, wipe-off cover and a ring binder, so it's a cookbook that will stand up to real-kitchen abuse. I almost hate to part with it, but I've got a copy to give away. If you want to try for it, post a comment here with your name or a name I can use to recognize you. Check back on Monday, when I'll post the winner of the random drawing. I can never decide what to make, this would be perfect. Thank you for sharing your copy of this cookbook. I need some new ideas for potluck meals at school. Sounds like a very helpful cookbook - thanks for sharing. I love Potlucks. Always a good meal with friends. If this book can solve the trilemma you describe, it will be an invaluable resource. Please drop my name in the pot! If it wasn't for Potlucks, i'd have no luck at all. . .
Oh, this would be so nice for my wife and I who enjoy potlucks and cooking together! With Easter fast approaching, we could put this cookbook to good use! My mom would so love to have this cookbook! Oh this is great! I would love to be entered. I sure that there are many Ideas for dinner that the book supplies. I have the worst time coming up with ideas for dinner. I love cooks illustrated books. Haven't seen that one and would put it to good use. I hope I win! Greatings from Italy!